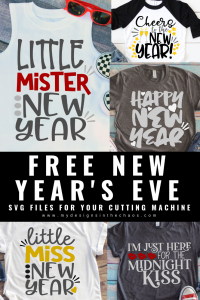 With the New Year right around the corner I know that these Free New Year’s Eve SVG files will be put to good use in no time flat. There are five different free files below. They are for you to create shirts, signs, and decor for your holiday parties. Feel free to add in a year to any of the designs and make it a little bit more personalized. If you have a hard time finding a matching font, check out this post or our resource section where we share where we get all our favorite fonts here. As always we don’t mind if you make items for your own personal use or even to sell. We do request that there is no outsourcing of the item (like Amazon Merch or Printful, etc.) and that the design is limited to 200 uses or less. Also please don’t resell or share the design. Feel free to direct your friends here so they can download them for themselves. So let’s dig in a see what cute NYE freebies we have available for y’all today! Please note that there are affiliate links in this post which means that we earn a small percentage when you shop through these links. This first design is just a classic. A project can easily be made with the hearts or they can quickly be removed for something a little less feminine. I can see this SVG going on a sign, an adorable garden flag like this one, or even just a simple T-shirt. Like I said…. it’s just a classic. One thing that I absolutely love about this design is all the ways to make it more personal. Add the year to the bottom, put an initial on the champagne glasses, or even layer letters on some of the stars around the words. Each of those options would be adorable. If you are using adhesive vinyl we demonstrate exactly how to layer that here. Remember though if it is going on a shirt, use heat transfer vinyl. 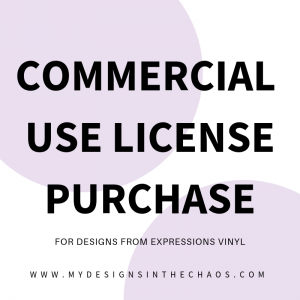 In this post we talk about all the different types of vinyl and when to use what. I can see this design being so funny and cute on a little puppy dog shirt or even on a little baby onesie. Because let’s face it, who doesn’t like to give babies kisses?! I already know that I’m going to be putting this design on a shirt for one of my little guys. (even if they don’t make it all the way to midnight) Our local museum does a countdown at noon and this shirt would be great. I think it would really pop if you used this brick vinyl on the word mister. It makes it just a little bit raised and gives it a 3-D effect without too much bulk. They could be festive while still being ‘cool’. Who do you know that needs this design? 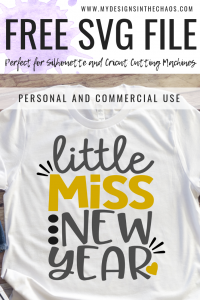 All this design needs is some glitter heat transfer vinyl and your little one will be the star of the NYE evening. Get an adorable big sparkly bow to match the heat transfer vinyl and she will be set. We would appreciate if you pinned your favorite images (or all of them) before downloading the files below. Your support is what helps us continue to be able to provide freebies for y’all. 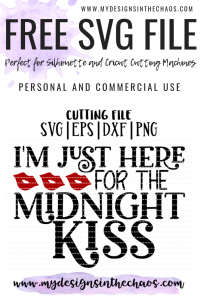 Also if you loved these files I bet you will also love these NYE SVG cutting files. Scroll down below to grab your freebies. 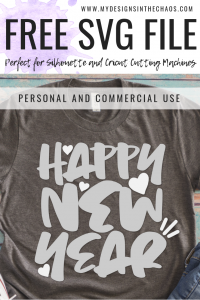 Browse more NYE designs here and check out some additional holiday freebies over on this post here. Also make sure to share this post with a friend! The more y’all share the more we are able to provide freebies and goodies. Happy crafting, cutting, and chaos!! Thank you for the free files. I am new to SVG’s. But I really like what I see. I know I will learn a lot just by being here. And thank you for the start. Hmmmmmm that is very strange. They seem to be up and working on our end. I would double check that your browser allows cookies and downloads from our site. My guess is that there is a firewall up that is preventing the download.